This was first posted in November 2011 on my old blog. Opening Sentences: The day she was born was the happiest day in her parents’ lives. “She’s perfect,” said her mother. “Absolutely,” said her father. And she was. She was absolutely perfect. 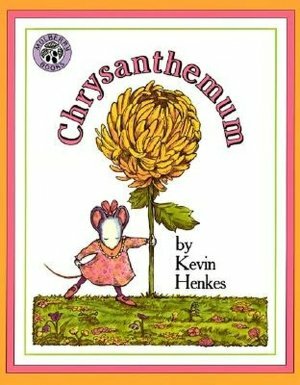 Synopsis: The absolutely perfect little girl is named Chrysanthemum. As she grows up, she loves her name. Absolutely. That is, she loves it until she gets to preschool and is teased about the length of her name, about being named after a flower — when faced with such teasing, we are told “Chrysanthemum wilted.” Only when a beloved teacher tells her name — Delphinium, and says she is thinking of naming her as-yet-unborn baby Chrysanthemum, does Chrysanthemum regain her joy in her name, as her classmates clamor for flower names of their own. Activities/Resources: This is a popular book with teachers to use during the first days of a new school year, to highlight how each child is unique, and to begin to talk about teasing. This link will lead you to many suggestions for the book’s use, compiled on the Teaching Heart website. # 1 in Perfect Picture Book Fridays. For the full list of Perfect Picture Books, please see this listing on Susanna Leonard Hill’s blog.